The Pumpkin Spice is flowing, and that can only mean one thing: it’s the time of year for spooks and hobgoblins and scary movies — Halloween! There’s nothing scarier than the fear of the undead rising from their graves with a taste for human brains, and so I’ve gathered a few video games, in no particular order, that feature zombies to satisfy your craving for zombie slaying! Telltale’s The Walking Dead (2012): This is a game loosely based on the comic series by Robert Kirkman (and the television series on AMC). It’s not particularly violent; the player basically makes decisions that affect the story in a unique interactive movie-type way. This game is available on mobile devices, PC, Xbox 360, Xbox One, Playstation 3, and Playstation 4. State of Decay (Undead Labs, 2013): This is similar to The Walking Dead, as it isn’t particularly violent, but focuses more on the survival aspect of a zombie apocalypse situation. The player has to scrounge for materials and lead a group of survivors. It’s third person and open world, which means there’s plenty of things to explore. State of Decay is available on PC, Xbox 360, and Xbox One. Red Dead Redemption: Undead Nightmare (Rockstar. 2010): Similar to State of Decay, this is an open-world third-person shooter. It’s a little more violent and takes place in the American Old West, focusing on the Western United States and Mexico as it slowly gets taken over by hordes of zombies. The game focuses on James Marston as he searches for a cure and hunts zombie animals as well as mythical creatures such as Bigfoot. Undead Nightmare is available on Playstation 3 and Xbox 360. The Last of Us (Naughty Dog, 2013): Full disclosure, I have not played this game. It isn’t for lack of want, as it’s a first person survival game with great characters and story, and so it’s right up my alley. It’s that it’s Playstation-exclusive, which makes it difficult to play for those of us who don’t have one. Anyway, it’s an action-adventure that uses weapons and stealth to eliminate threats and focuses on survival. It’s got great reviews, and is highly recommended if you’ve got a Playstation 3 or 4. Left 4 Dead/Left 4 Dead 2 (Valve, 2008/2009): This is a first person shooter, and tends to be gory and violent. Both games focus on a group of four survivors from different backgrounds as they fight to survive hordes of zombies. The game features special zombies such as the Tank, Witch, Boomer, Smoker, and Hunter, each with their unique abilites, and all of which scare the ever-living crap out of the player by pouncing when they least suspect it. The game is super fun playing with up to three friends (although the console version only allows two players per console) and focuses on a cooperative experience, forcing the player to choose between leaving a friend behind to be mauled by zombies or going back for them. Both games are available for PC, Xbox 360, and OS X. Dead Island (Techland/Deep Silver, 2011): This game is similar to Left 4 Dead, in that it’s a cooperative first person shooter, and quite violent and gory. 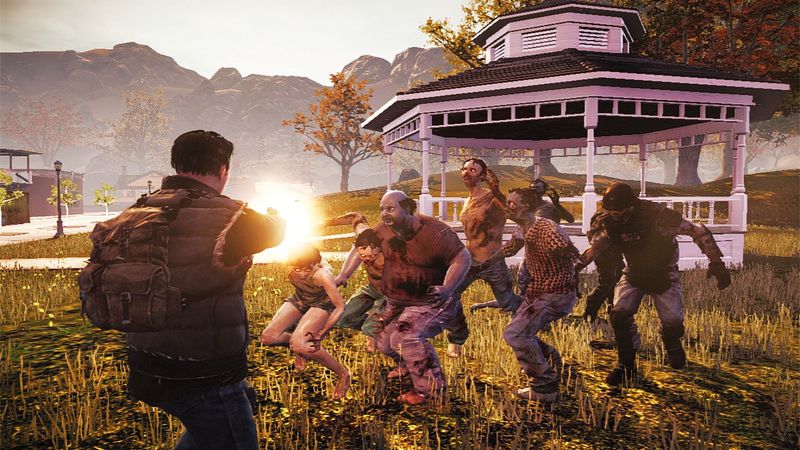 The game takes place on a resort island that has been taken over by an infection that turns people into zombies, and takes the player on an adventure to get off the island by helping other survivors and slaying zombies. The game allows the player to craft weapons that can deal extra damage with electricity and fire, and is fairly open-world. 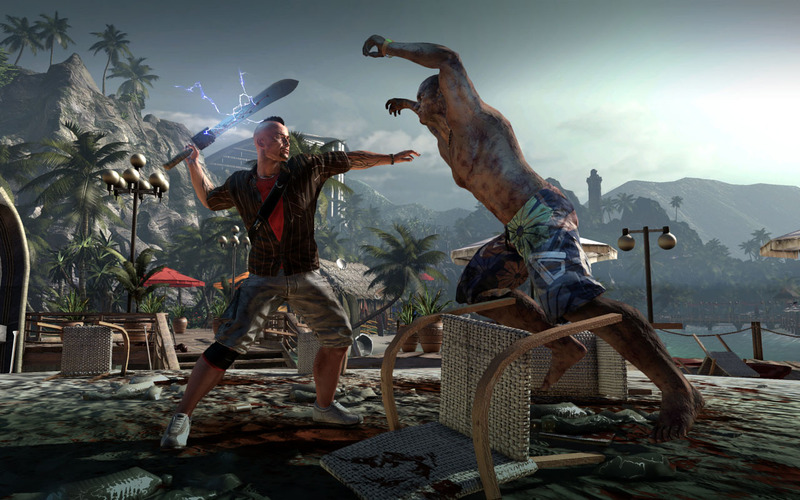 Dead Island is available on PC and OS X, Playstation 3, and Xbox 360. Dead Rising1/2/3 (Blue Castle Games/Capcom): This series focuses on surviving for a set amount of time and takes the player on missions to help other survivors. It is quite violent and gory, and uses a crafting system similar to Dead Island’s, but allows you to create more outrageous weapons. I recommend Dead Rising 2, which follows a stuntman and his daughter who has been bitten, and allows the player to dress the character up in ridiculous costumes while searching for medicine for the little girl. Dead Rising 2 is available on PC, Xbox 360, and Playstation 3. 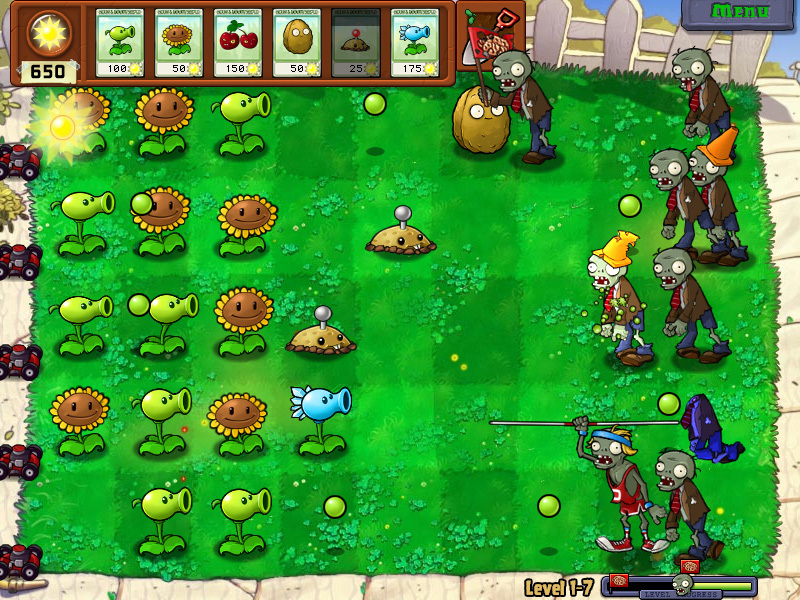 Plants vs. Zombies (PopCap games, 2009): This is a tower defense game in which the player protects their home from zombies using a variety of super plants that can shoot zombies. There is no violence and no gore. 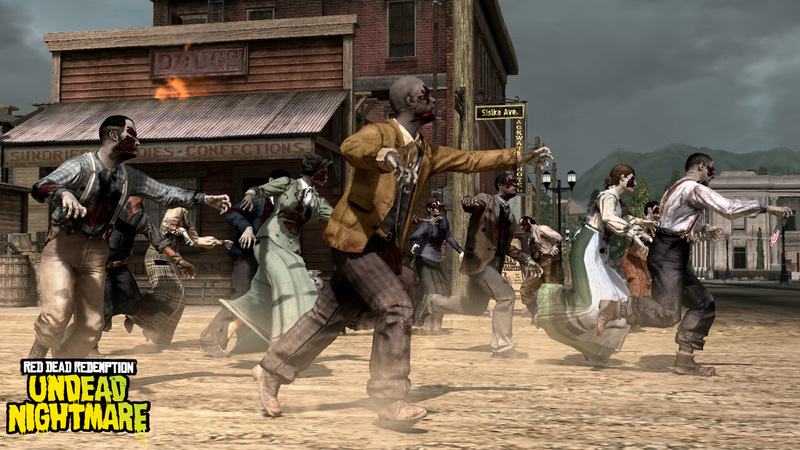 The player gathers sunshine in order to purchase other plants perform a variety of functions such as shooting peas, keeping the zombies at bay, hurling sprouts and producing sunshine. Plants vs. Zombies is available on various platforms. DayZ (Bohemia Interactive, to be fully released in 2016): This game is unique in that while it is an open world zombie shooter, the main threat is other players. It’s a competitive (or cooperative) game in which you encounter other players among the hordes of zombies, and there’s no guarantee that they’ll be friendly. The player scrounges for materials and gear, and the fear of losing your supplies is greater than that of the threat of being eaten by zombies. Day Z is currently available in a development state on PC, but will be released on Xbox One and Playstation 4 in the future. The Zombie Island of Dr Ned (Gearbox Software/2K Australia/Telltale Games): This is an expansion to the game Borderlands in which the players work alongside Dr. Ned to find a cure for the citizens of Jakob’s Cove who have mysteriously turned into zombies and other abominations while protecting those who haven’t. Like Borderlands, the game is violent and gory, and is a first-person shooter. Borderlands is available on various platforms. Honorable Mentions: There are a ton of games that have Halloween-themed updates, and it would be difficult to cover them all. Team Fortress 2, for example, usually features new costumes and spooky maps in their Halloween updates. The Lord of the Rings Online and other MMO’s often have Halloween-themed festivals as well. LotRO’s festival features a haunted house in the Shire for players to explore and earn tokens to exchange for cosmetic items, for instance. 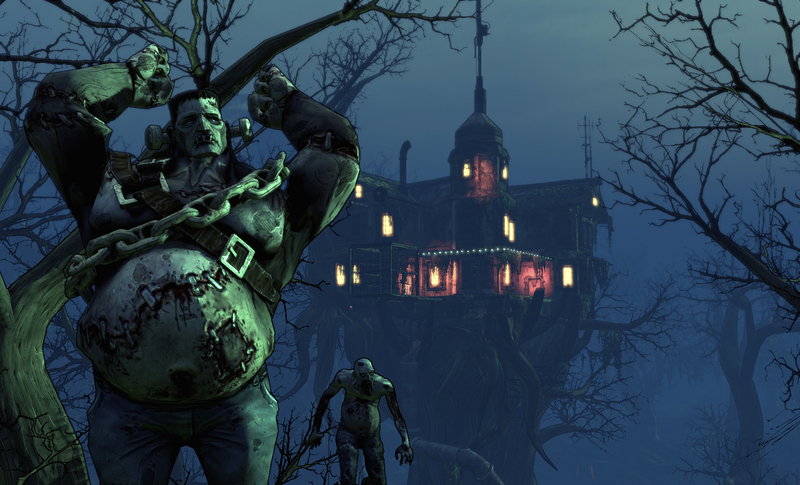 Check to see if your favorite game has some DLC for Halloween or features a Halloween update.